This gallery features original works of art inspired by the phonograph. 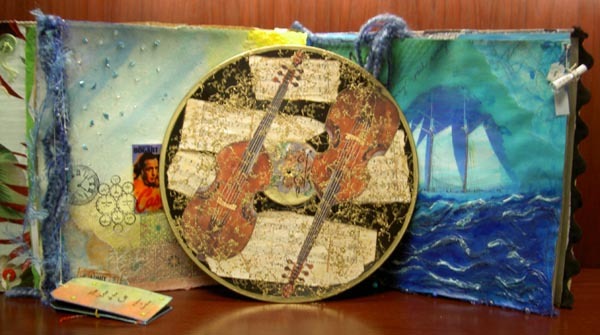 Phonographia (memorabilia of the phonograph) are displayed, celebrated and even used as source materials in this selection of mixed media creations. All pieces are held in private collections and were created by Friends of the Phonograph. 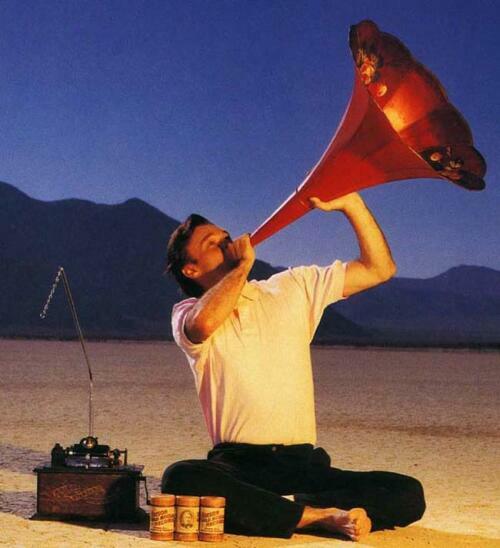 Description: This photograph appeared in the book, Portraits on the Playa: The Black Rock Desert, and it commemorates the birthday of the phonograph with DB trumpeting to the stars to "Remember the Magic - Happy Birthday to The Phonograph!" Portrait on the The Black Rock Desert, Gerlach, Nevada, USA. Description: This photograph (top) is a re-creation of the famous oil painting (below) by Massani in 1905. Edison used this piece (in this case as an advertising postcard) in literally hundreds of thousands of Edison Phonograph advertisements. 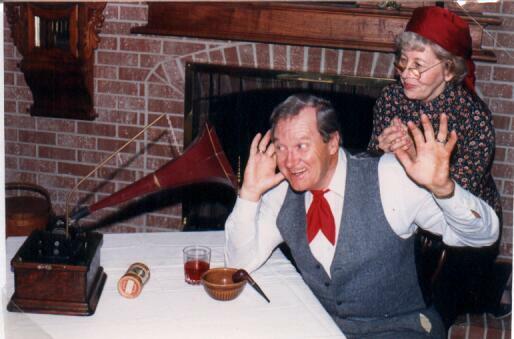 The "actors" in the 1982 re-creation are Axel and Betty Boilesen who produced this dramatic portrait as an entry for the Friends of the Phonograph's annual birthday party. 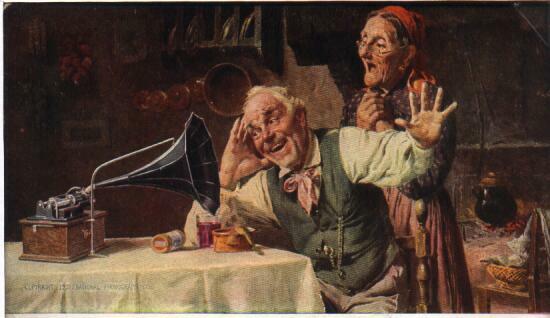 Massani's painting was titled "The Phonograph" but it is often called "The Old Couple." 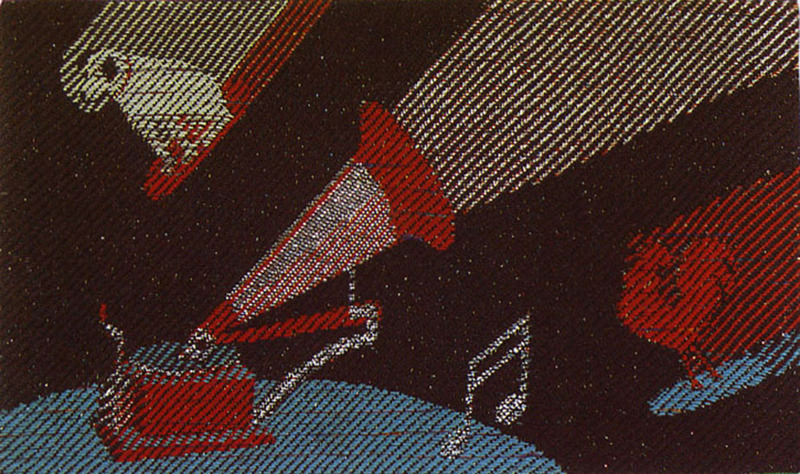 Description: This sampler was a 1981 artistic entry for the Friends of the Phonograph's annual birthday party. 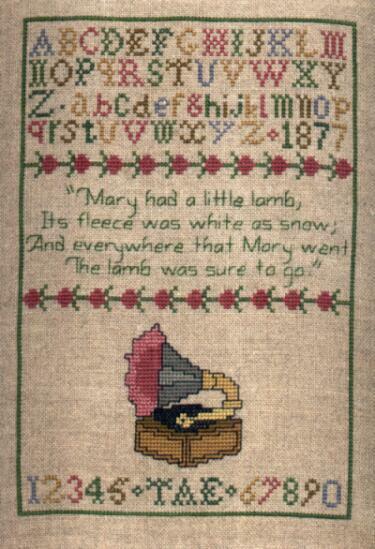 Besides the traditional alphabet, Kathy Aiken's sampler features the first four lines of the nursery rhymn "Mary Had a Little Lamb" which were the first words spoken by Edison's tin-foil Phonograph in December 1877. The bottom row of numbers has Thomas Alva Edison's initials TAE inserted between the 6 and 7. 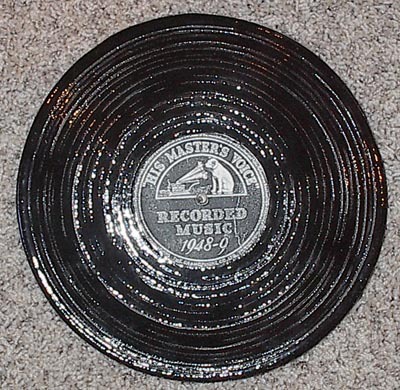 Description: This ceramic record was made by Bob Gross in 1989 to help celebrate the Phonograph's birthday. It features a Victor style "His Master's Voice" label with Nipper and the Gramophone, and a title of "Recorded Music 1948-9". 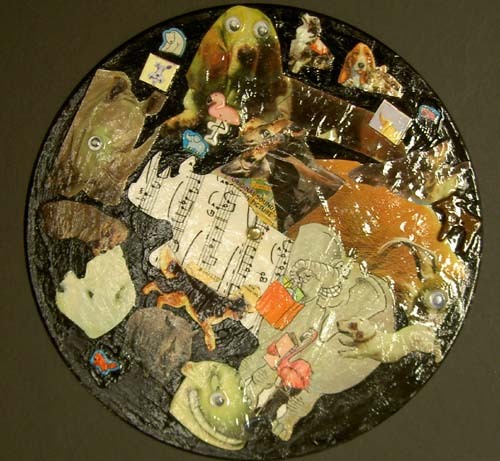 Description: This textile art by whimsical artist Sheila O'Hara (known for her warp sense of humor) was created in 1987 to celebrate the 110th birthday of the Phonograph. Sheila's layered weaving technique blends multiple colors by threading four sets of colors or warps all weaving at once. This creates a two-sided fabric, with one weft and one layer. Although the piece was commissioned to celebrate Edison's tin-foil invention, other phonograph related symbols are displayed. The featured talking machine is Berliner's Gramophone performing the dual role of a searchlight and record player. The Victor dog "Nipper" speeds through the sky on a disc record. 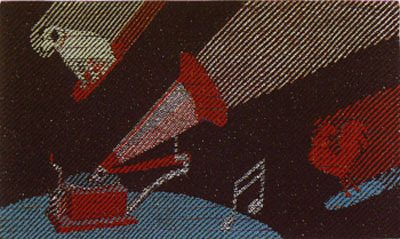 The rival Pathe Rooster flies by on another record.The Columbia Graphophone Company's logo "Note the Notes" is the other piece of phonographia. 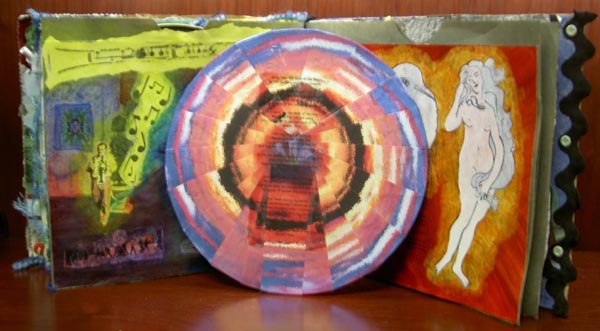 Venita also created the back cover and inside front. This Round Robin was Venita's, with contributions from Michelle Schell, Leticia Gronlund and Lynn Henry. 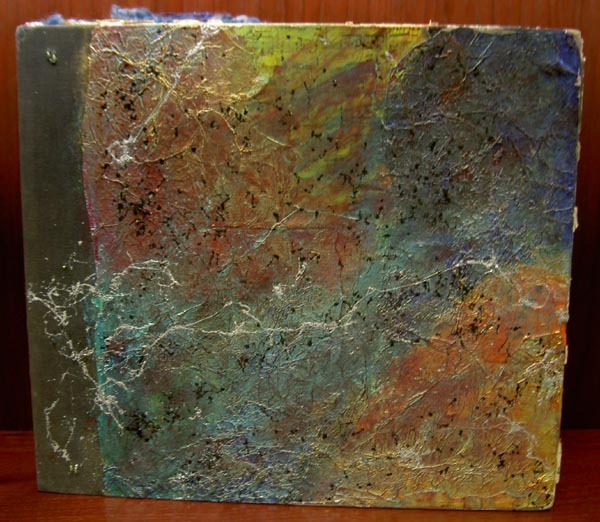 When asked for an artistic explanation of this piece, Lynn Henry provided these words from her artist friend Michael deMeng who had presented this lecture at ArtFest in Port Townsend, Washington in March 2006. Description: This phonograph record was mailed from one artist to another with a note written on the reverse side. This is of a genre called 'Mail Art' where different objects are artistically altered and then sent through the mail, possibly back and forth, from one artist to another. As you can see from the post this record was mailed as you see it here. 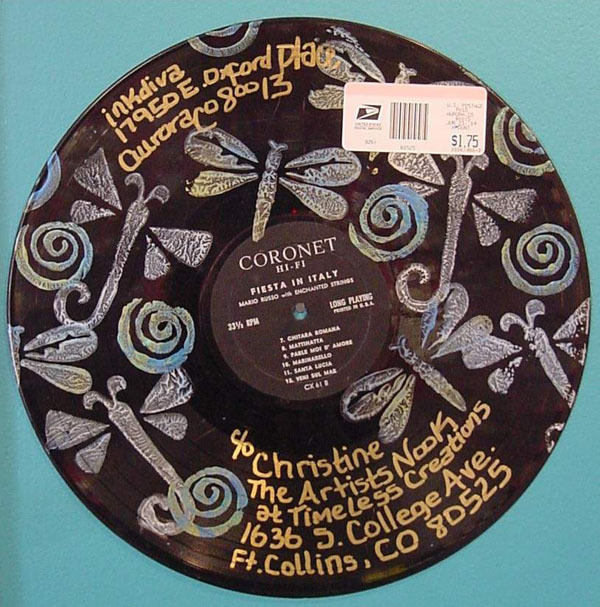 This phono mail was created by Susan Wacob and is owned by Christine Webb owner of The Artists' Nook in Fort Collins, Colorado. 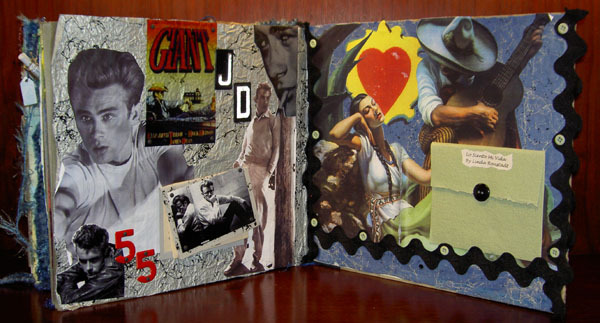 Description: This collage, created by Bailey Nolder, Grade 6 at Zerger Elementary school, was selected for the Jeffco Elementary Art Show in 2006. 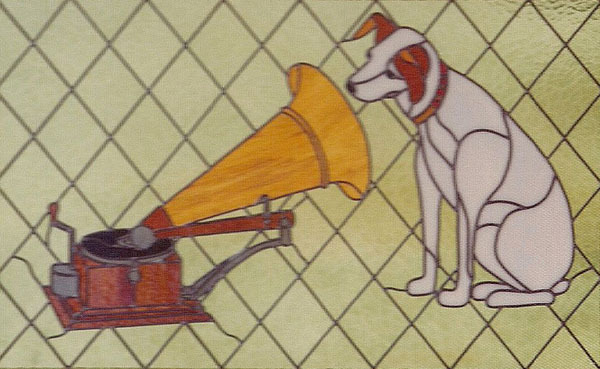 Media: Leaded stained glass, 24" x 36"
Description: This window features Nipper, one of the most famous advertising images of all time, listening to the Berliner Gramophone.